This entry was posted in Flowers, images of flowers, insect images, Uncategorized and tagged Cee's Flower of the day challenge, flowers, images of bees on October 18, 2018 by lifelessons. as though invited at my behest. upon that morsel that I loved best. I guiltily consume the rest. The prompt today is pest. This entry was posted in Daily Post, Daily Prompt, Humor, humorous poem, humorous poetry, Humorous Rhymes, insect images, Insects, insects in Mexico, insects of mexico, poems, Uncategorized and tagged Daily Post, Daily Prompt, flies, food, humorous poem about food, La Mosca, pest, photo of fly, poem about flies, poem about pests on July 29, 2017 by lifelessons. This beach companion was fascinated by my Diet Coke. Pedro says this is proof that they actually do slip sugar into diet drinks here. He ended up submerged, in spite of my best efforts to dissuade him from taking the icy dip. This called for pouring the coke and corpus onto the sand. In lieu of artificial respiration, I blew on him and from a seemingly comatose state, he came to, crawled away, and in time flew away. I wonder how many watery graves this fellow has escaped. This entry was posted in insect images, Insects, insects of mexico, Uncategorized and tagged Bee, images of bees on March 10, 2016 by lifelessons. What are these leaves doing scattered over the terrace just hours after Pasiano swept? I decide to investigate. Aha! The evidence is pretty clear when I find a chewed-up leaf. Can you see those razor-sharp incisors about to close around this leaf? 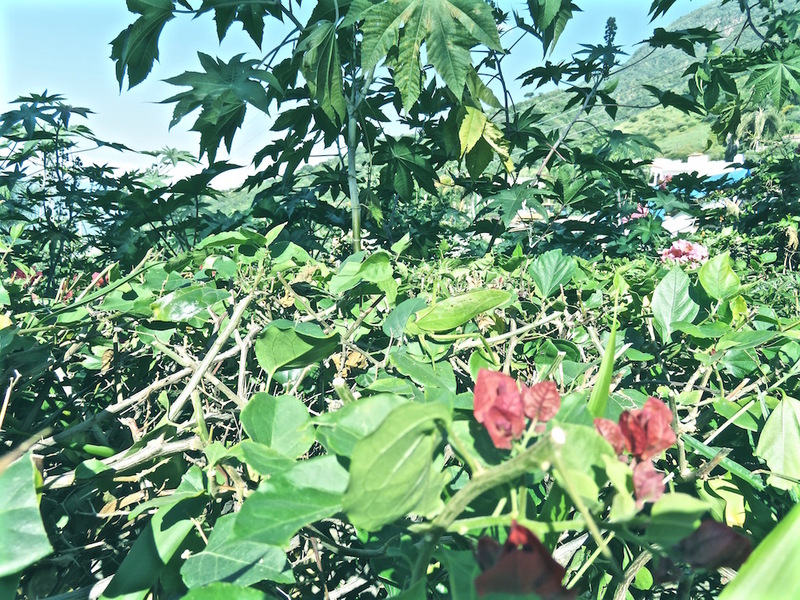 More leaf-cutter compadres ascend my hibiscus, scouting out fodder for the hundreds of ants who will trek here in darkness to strip the bush and carry it away. The team work is so incredible that I hate to interfere, but if I don’t, there will be no foliage surrounding my house by the time I get home in two months. By tomorrow, all the pellets will be gone, carried away by these bearer ants–and hopefully, the ants will be gone, too. Hormigas, by the way, is Spanish for Leafcutter Ants. (I didn’t want to give away the answer before the question was asked.) They are fascinating to watch, with their generals and slaves, double machete-weilding lumberjacks dropping pieces of leaves to the bearers below, tinier slave ants carrying many times their own weight, some ESP that causes swarms of ants to appear to help any ant who needs help over an obstacle or out of a hole. 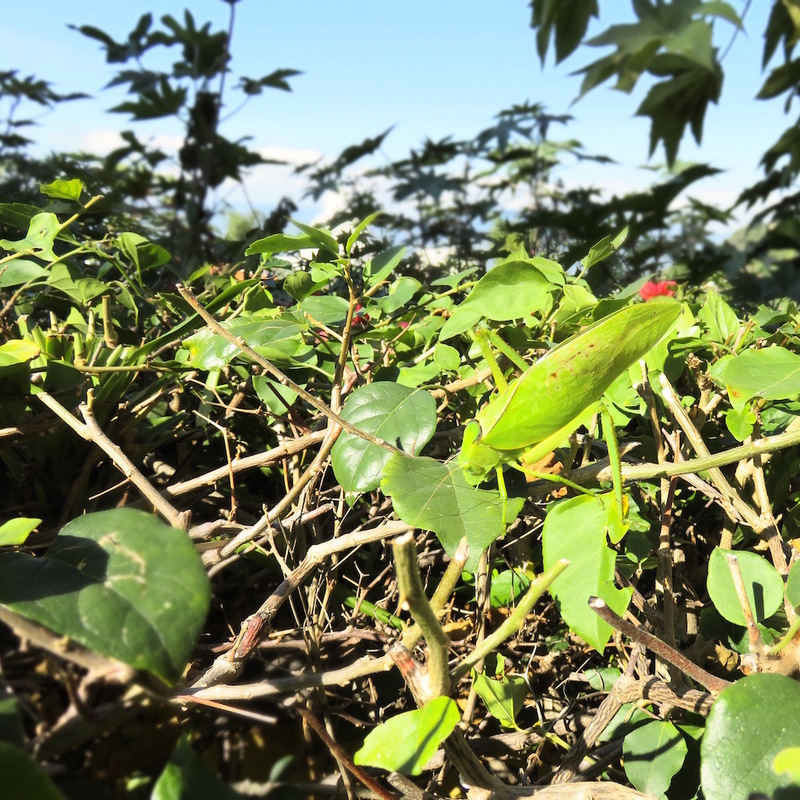 I could watch all day as bush after vine is depleted of leaves and flowers, but then–I’d have no bushes or flowers, so I resort to the little pellets that, carried back to the nest, with luck for me and no luck for the ants, will clear it out. Cruel nature either way. This entry was posted in animal images, Animals, insect images, Insects, insects in Mexico, insects of mexico, Uncategorized and tagged ants, images of ants, images of leaf cutter ants, images of leafcutter ants, Judy Dykstra-Brown Photos, Leaf cutter ants on January 16, 2016 by lifelessons. Katydid? Just What Did Katy Do? Two months after my husband’s death in California, I moved to Mexico. 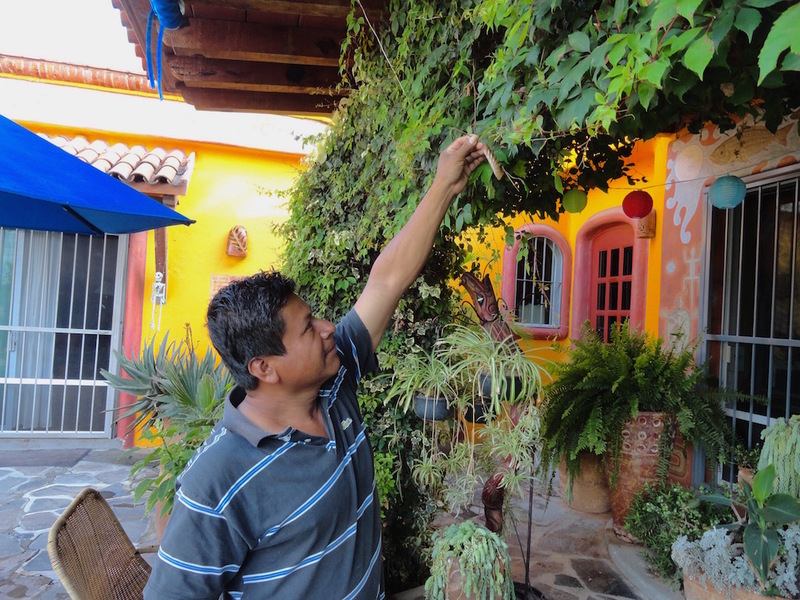 Once there, my days were filled with the completion of my house and the buying of appliances, furniture, and familiarizing myself with the language, processes, mores and customs of Mexico. Although at first I knew no one in my new country of choice, my life quickly filled with the observation of the strange plants, animals and insects that appeared one by one to claim my wonder. After 14 years, they still do! This poem was written during my first month in my new house. As stories do, this story was just repeated in a slightly different version yesterday. You can find that story HERE, but the poem below is fourteen years old. crunched you right down with the next forkful. stroking your proboscis with your curious hand shaped like a snake’s tongue. trying to stroke music from the keys. on nourishment too minuscule for human eyes. Your broad chest expands and deflates like a bellows. Whatever it is you most resemble––none have your talent or your wing power. Your alien protuberant eyes like small yellow beebees. Now trapped in my jar, you define your glass prison with leg after leg, like a mime. what do you make of this white world of mine? You have enthralled me with your alien looks. that now I feel the need to look at everything more closely for myself. then drum drum the glass. “What is there?” you seem to ask. Nothing to nourish you here. I sit staring in at you. opening like petals of a flower as you put your foot in it. you limp around the glass on geriatric legs and padded feet. in the crumbling pot up on the wall. you test each new leaf for it’s ability to support or give. In five minutes, one-fourth of the leaf is gone. like a child with a cookie in each hand. against the potted geranium that I have set you down in. 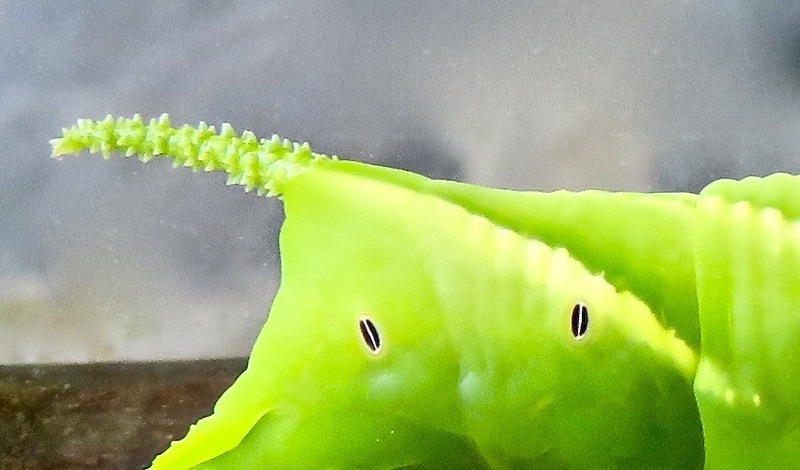 takes sharp bites–like a leaf cutter ant. sweeping the diminishing leaf edge like a vacuum cleaner. One-quarter of the leaf gone in five minutes. as finally we stand eye-to-eye at the same level. not the dark green of this tree. you rock on a hobby horse of legs. rippling like an air balloon. the origin of your song. fills with the sounds of yours. To hear Katydids, you can go HERE. And for a fascinating closeup video of what I experienced first hand above, go HERE. 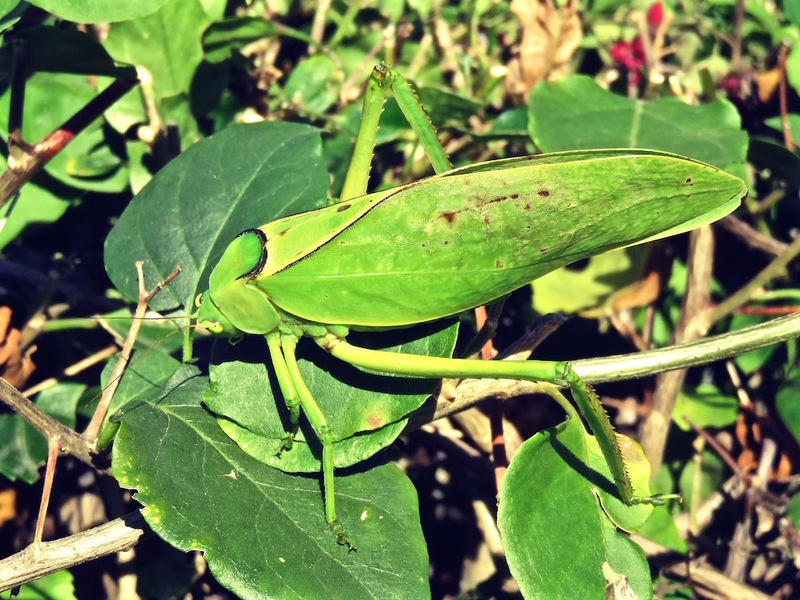 See if you can distinguish “my” katydid from his background in these pictures. This entry was posted in insect images, Insects, insects in Mexico, insects of mexico and tagged image of katydid, images of insects, insects of Mexico, katydid, Mexican insects, sounds of mexico on October 4, 2015 by lifelessons. 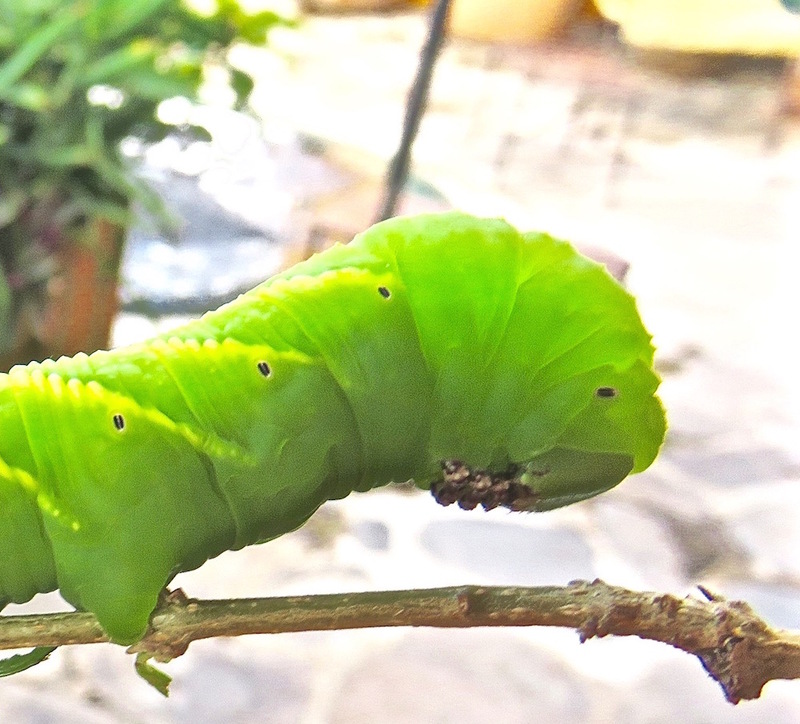 For the fourteen years I’ve been in Mexico, a bright green caterpillar (actually, the larval stage of the hornworm at this stage) has invaded my Virginia Creeper vines. It wouldn’t be much of a problem except for the fact that they poop lots of black pellets about 1/2 inch in diameter directly onto my glass tabletop and all over the terrace floor. I can never see them against the green of the foliage, so three or four times a year, Pasiano is recruited to use his keen eye to discover them and relocate them to my houseless extra lot next door. I think his/her little green tail looks like one of those little brushes that is used in place of floss or a toothpick to clean between teeth. If we don’t catch them during the green stage, they begin to morph into a creatures you wouldn’t believe were stages of the same being. And this guy was caught at the same time we found the littler guy above. This shot shows their size in relation to each other. 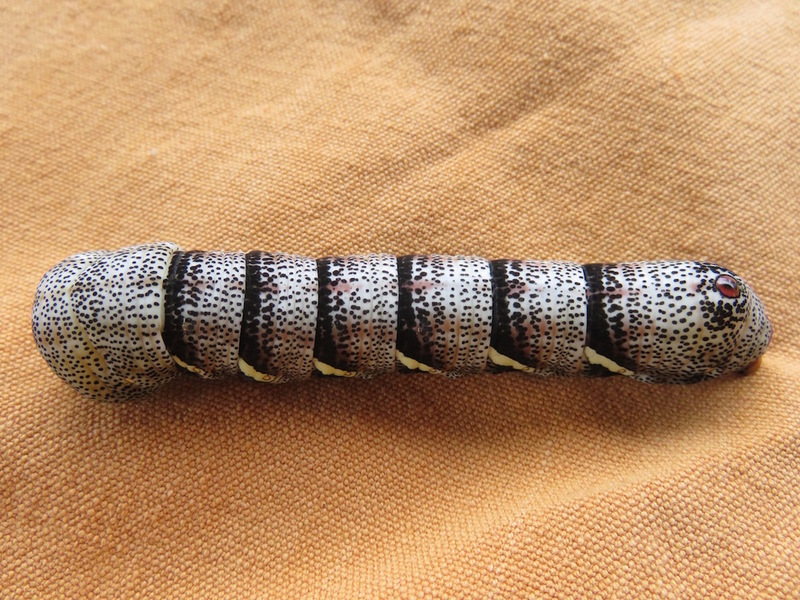 The larger one is four or five inches long. Their heads look like the rolled part of an uninflated balloon and are translucent and polka dotted. The racing stripes add an extra flair in the littler guy whereas the larger one looks more sedate in his brown and white striped pale gray suit. Two different caterpillars or stages of the same creature? And, are they later stages of the green larva? If so, why is the one guy smaller? Questions, questions. This is the next stage of worm that we found. 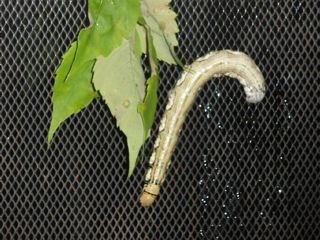 By now, I have discovered that it is a Hornless Hornworm (Acemon Sphinx) and that they lose the little horn on their rear end (you can see the detail on the first green stage above) after their first molt and it is replaced on each of the subsequent larval stages with an eyespot that you can clearly see in the picture below. 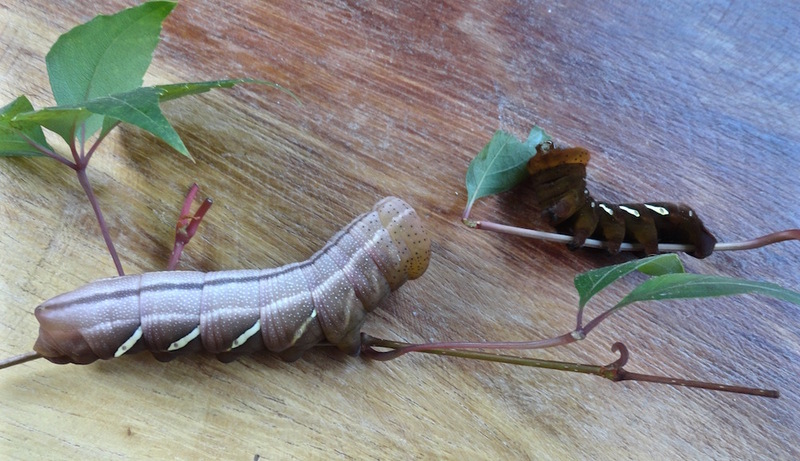 That one eyespot on the tail end seemed spookier when I thought it was a cyclops eye on the head of the hornworm! 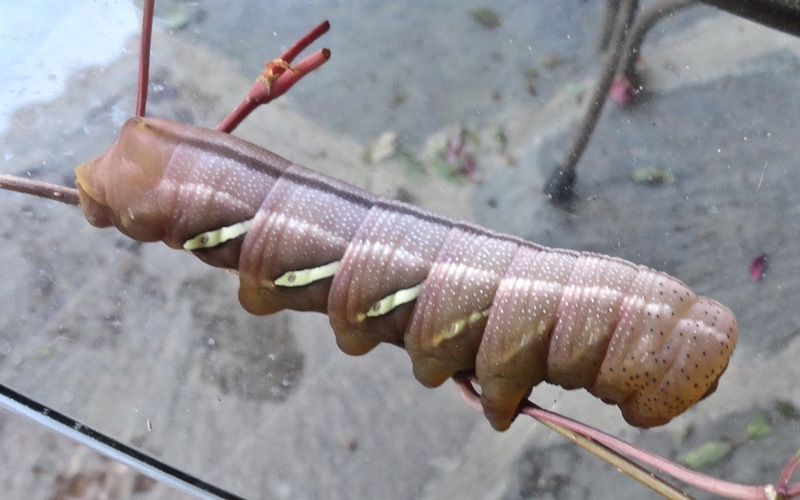 The most interesting part of this story is what this caterpillar turns into. So far as I know, I’ve never seen the insect stage–perhaps because I am too insistent that Pasiano removes all the larva to relocate them. I have just this year discovered that they actually turn into hummingbird moths that are avid pollinators of many of the flowers I grow. They are also beautiful–often being mistaken for hummingbirds. I don’t think it is fair for me to download a picture of the moth, since all of the photos above were taken by me and if I had been more aware of anything other than my Virginia creeper, I would have known that it might be worth putting up with the worm poop to be able to see the hummingbird moth. 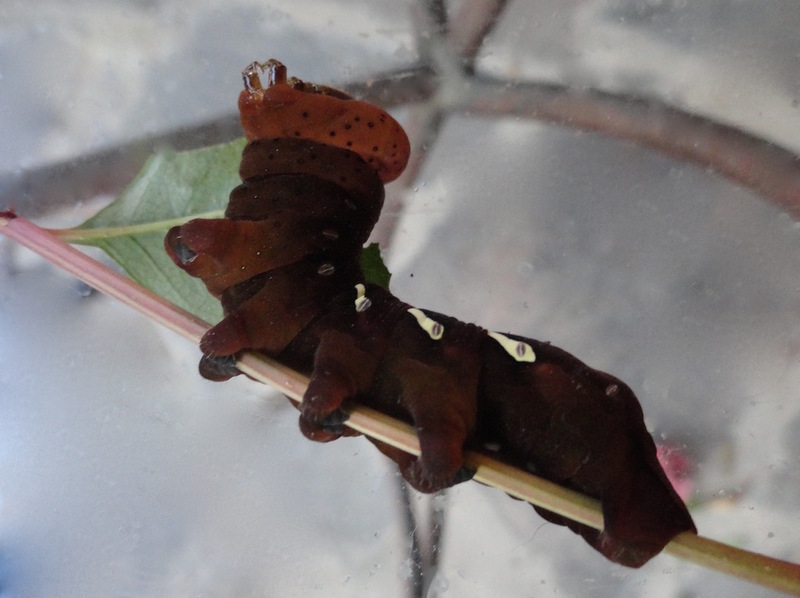 So hereafter, I vow that I will not relocate any more hornworm larva or caterpillars at any stage. And it may take another year, but I promise to take a picture of the first hummingbird moth that I see. 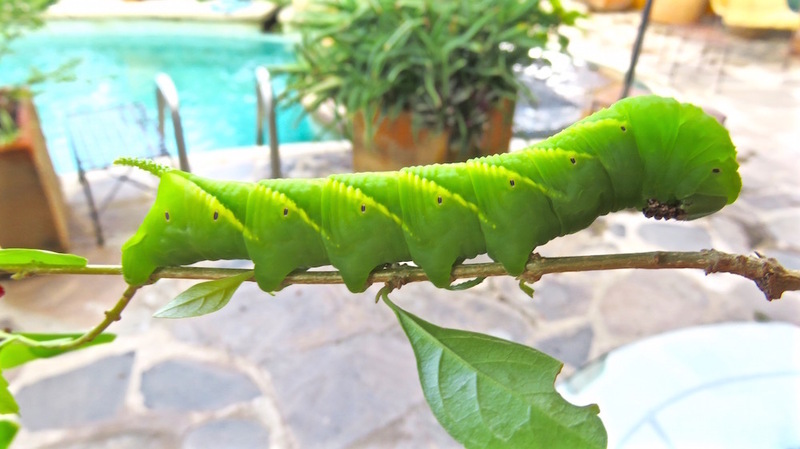 This entry was posted in insect images, Insects, insects in Mexico and tagged Friday Photo Challenge, hornworm images, hornworms, hummingbird moths on September 26, 2015 by lifelessons.